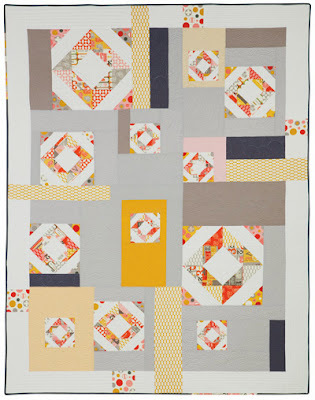 I almost forgot about the Blogger's Quilt Festival! I guess all the chaos leading up to Houston and then coming home to Halloween has made me a little absent minded! I'm sure it's no surprise to my readers which quilt I am submitting - yes, it's my quilt from the Classic Modern Quilts book. I've been slacking - this is only the 3rd quilt I've completed this year! Time to get some tops quilted, I guess. I'm entering this is the throw quilt category. Some details about this baby. I used mostly Kona solids, with some Moda Bella and Freespirit too. The prints are from 2wenty Thr3e by Eric & Julie Comstock for Moda. I used a fat quarter bundle and a charm pack, and had some left over for a strip on the backing. I love that all three sizes of diamonds in this quilt started with 5 inch charms. Depending on how you stitch them together, you can make different sizes of half square triangles. You guys know how to do this, right? If not, leave me a comment and I'll write a follow up tutorial. I absolutely love the quilting. Tia Curtis did a fabulous job and chose the designs herself. I love how the swirly quilting looks on the solids. They even used a photo of the quilting on the back cover of the book! This throw measures 59 1/2" x 76". Thanks for visiting! We'll be doing a blog tour with all of the authors soon, and some giveaways. Be sure to follow me somehow so you don't miss out! Gorgeous! Love the improv feel to it. Great fabric choices! Cool quilt! I just "hearted" it in the festival as my favorite throw quilt. I love the grays with the pop of yellow. Very striking and pretty. Love it!